Before the 16th century Reformation, the Catholic Priests of this pretty town ministered at the vast church of St Michael, off of the market place; but once they were given their marching orders, those who adhered to the old faith had something of a struggle to maintain a sacramental life. At the risk of a grisly death, the Jesuits were busy down the road in Norwich in the penal years, and in the Aylsham area itself there is a patchy record of the presence of Catholic Priests, either passing through fleetingly or sheltered by one or other of the big houses. In any case, the Catholic population of East Anglia was tiny until the 19th century, and Norfolk was an outpost of the Midland Region, to be placed in its eastern division, the Diocese of Northampton, at the time of the Restoration of the heirarchy in 1851. This coincided with a massive growth in Catholic numbers, both as a result of the movement of population caused by industrialisation, and a wave of conversions in the second half of the 19th century. One of those received into the church in Norfolk was the Reverend SM Shepheard. 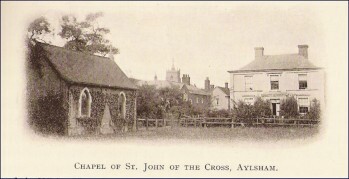 He had been Church of England Rector of the tiny parish of Calthorpe, just to the north of Aylsham, for forty years. 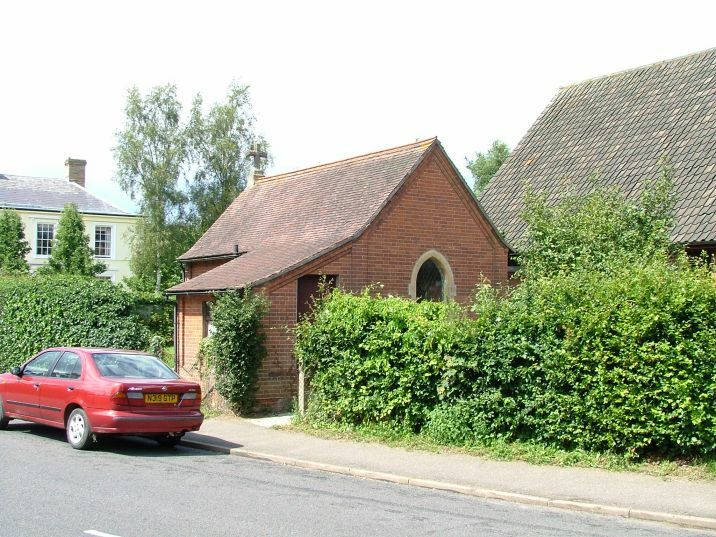 When he died in 1899, his daughters built a Catholic chapel in his memory, in the garden of their house in White Hart Street, Aylsham (see image below). This building substantially survives, and can be seen in the first of the smaller pictures above. The rebuilt west wall, new roof and addition of a porch give it more of a feel of the 1930s, but the gable cross is the original. It now forms the vestry to the modern church. 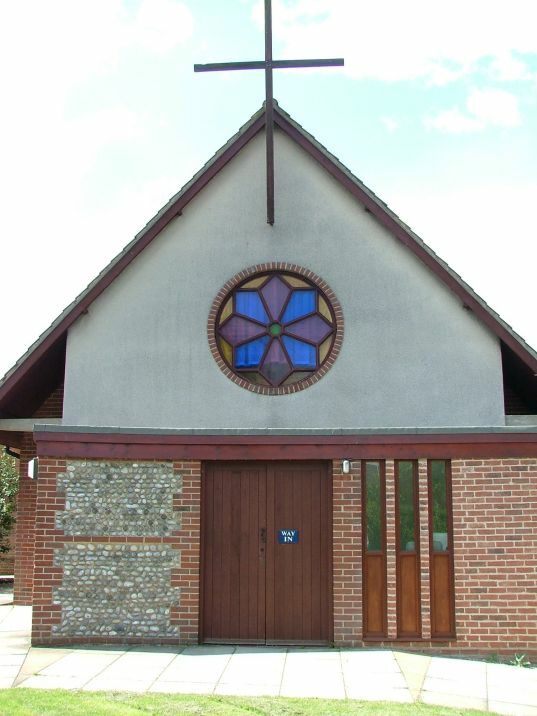 The little chapel was an outstation of the Church of St John the Baptist in Norwich, and under later reorganisation became part of the parish of neighbouring North Walsham. 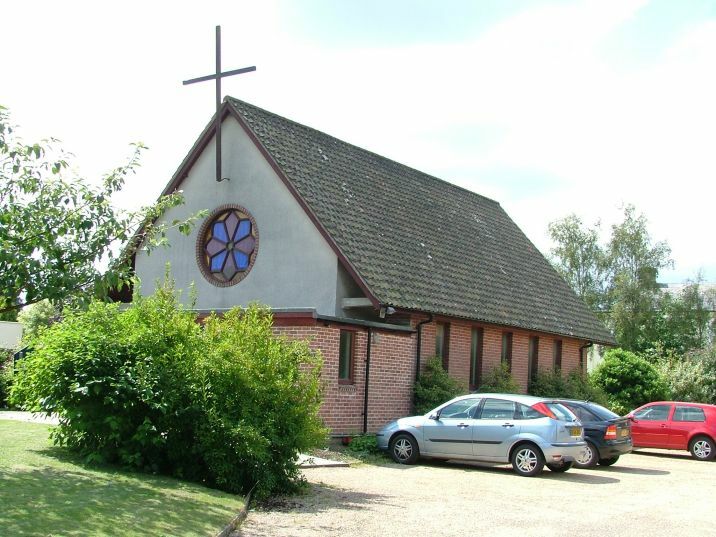 In 1961, the large modern church was built beside it; it is an irony that so many Catholic churches were built in East Anglia on the eve of the Vatican II reforms which would have dictated quite a different layout. The 1961 church is clean-lined and functional, seemly and fitting for its purpose. There is a scattering of flint on the west wall to remind us that we are in Norfolk, and garish glass in a rose window to remind us that this church was built in the early 1960s. Because St John of the Cross is a chapel of ease and not a parish church, there is no liturgical imperative for it to be open; and, of course, it is kept locked, keeping the faithful away from the sacraments that they yearned and risked their lives for over several centuries. And most Norfolk Catholic parish churches are kept locked too, which is a scandal. Meanwhile, in a Diocese where numbers continue to rise and some Catholic churches are filled to overflowing on a Sunday, the Bishop continues to spearhead reforms aimed at closing chapels of ease like this, and encouraging parishioners to drive to their central parish church, which may be ten miles away. I don't pretend to understand.